The Knucker (Draco troglodytes) bizarrely dwells in damp holes instead of caves. 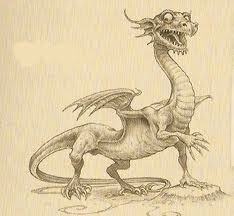 It has been incorrectly claimed that the Knucker is just a juvenile European Dragon. The Knucker uses its purple venom which is fifty times stronger than hydrochloric acid and can liquefy prey. They live in damp, deciduous woodland near rabbit warrens. They prefer to hoard household items rather than treasure. The eggs are in various shades of green for camouflage and their chicks are largely aquatic. They are 30 feet long. They have vestigial wings and are colored brown, dull red or a greenish blue. Their skin is leathery and their head is small. The call is a low gurgling or a bark in the mating season. They eat small animals though larger specimens have been known to take children.